ICT Finance Marketplace is supported by a partnership between the ACCESS-ICT, ICT VENTUREGATE and YMIR projects which are all funded under the Information and Communication Technologies thematic programme of the European Commission 7th Framework Programme. 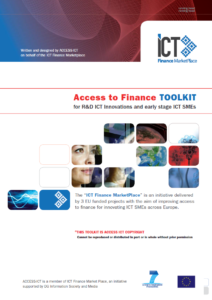 Whilst there are different sources of fi nance available, this toolkit is especially focusing on equity capital for early stage ICT businesses that have completed their main R&D phase, who may have accessed EU Framework funding, proved their concept and who may now be seeking to grow their business. The aim of this toolkit is to provide information and advice on how to become investment ready and notably, how to make your business proposition attractive to different types of early stage investors across Europe. The toolkit will guide you through the main steps that you will need to take in order to become investment ready. It reviews the specifi c challenges and opportunities that you face as an early stage ICT business, including advice and information from investors and industry experts. You will also fi nd links to a large number of relevant resources and tools. The toolkit draws upon the good practice and experience of ACCESS-ICT in collaboration with the other partners in the ICT Finance Marketplace project, namely VENTUREGATE and YMIR.